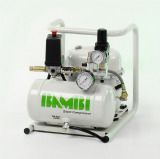 Bambi Air Compressors, from Birmingham Heartlands, the manufacturing hub of the Midlands, when a quiet running air compressor is required then look at the Bambi range of air compressors, there is bound to be one that is suitable for you; from the compact and value for money oil lubricated Budget Range and MD Range to the oil-free and ultra low noise HT Range and VT Range; the VTS Range combines style with silence. The Bambi silent air compressors are used in many environments from dental and medical applications through industrial applications including picture framing, glass engraving home DIY such as car body paint spraying. 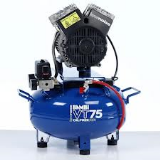 Our sales team will be happy to discuss your requirments, from home use DIY to medical and dental surgeries, the Bambi air compressor range is widely used in extensive environments. Delivery is normally 3-4 working days after placing order. Next day delivery can be arranged at an extra charge.